A most impressive detached residence occupying a delightful cul-de-sac off the Antrim Road benefiting from views of Cavehill. No expense has been spared in creating a luxurious and welcoming family home. Built for the present owners to an exacting specification, this superb home combines attractive elevations with an imaginatively designed internal layout offering beautifully appointed accommodation. This truly exceptional property is sure to appeal to a wide cross-section of discerning purchasers seeking a top quality home. Early viewing is recommended to appreciate this fabulous property. PVC front door, ceramic tiled floor, low voltage lighting, cornice ceiling, double panelled radiator, under stairs storage with light. White wall hung wash hand basin, low flush WC, ceramic tiled floor, extractor fan, low voltage lighting, panelled radiator. Franke basin 1/2 stainless steel sink unit, mixer taps, granite drainer, cream hand painted kitchen units, grainte worktop, built in Neff under oven, Neff ceramic hob, extractor fan, American fridge/ freezer housing, integrated Candy dishwasher, wine rack, island unit with granite worktop, ceramic tiled floor, 2 double panelled radiators, partially tiled walls, low voltage lighting, strip lighting, PVC french doors topaved patio. Feature Italian marble fireplace with marble hearth, living flame gas fire, cornice ceiling, 2 double panelled radiators, PVC french doors to garden. Access to roofspace, low voltage lighting, hotpress, panelled radiator. Double panelled radiator, low voltage lighting. Low voltage lighting, panelled radiator. White suite comprising tiled shower cubicle, vanity unit, mixer taps, low flush WC, tiled walls and floor, chrome heated towel rail, extractor fan, low voltage lighting. Double panelled radiator, built in mirror sliderobes, view of Cavehill. White suite comprising tiled shower cubicle, shower, wall hung wash hand basin, mixer taps, low flush WC, tiled walls and floor, low voltage lighting, extractor fan. Built in mirror sliderobes, view of Cavehill, double panelled radiator, low voltage lighting. White suite comprising panelled bath, showerscreen, mixer taps, Mira electric shower, pedestal wash hand basin, low flush WC, tiled walls, extractor fan, low voltage lighting, chrome heated towel rail. Enclosed brick paved garden to rear. Tap and light. Roller door, utility area - single drainer stainless steel sink unit, mixer taps, range of high and low level units, formica worktop, plumbed for washing machine, gas central heating boiler, Beam cylinder, partially tiled floor, PVC door. 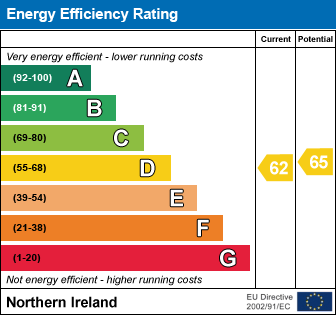 I am interested in 576C Antrim Road, Belfast. Please contact me about this property.